Tripping on Drew Holcomb’s discography is discovering a hidden deposit of Americana gold. The singer/songwriter has been recording albums since 2005, culminating in this year’s release Souvenir, which we liked a lot. (The Neighbors, his backing band with vocalist/wife Ellie Holcomb, first united in 2008 for Passenger Seat.) Cleanly delivered and robust, Souvenir serves as a sterling apex of the deft narratives and earthy hooks Holcomb’s been honing for more than a decade and a half. The artist recently stopped by Paste Studios (video below) before hitting Irving Plaza in New York City, where photographer Cortney Armitage documented his day in the gallery above. 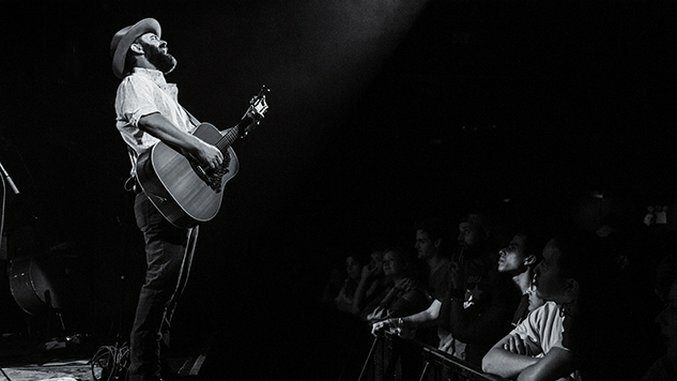 Drew Holcomb and the Neighbors kick off a new tour leg in September.